Pair a fleece cardigan and thigh high knit socks with Twisted Trunk Organic Cotton Tunic Top for a cozy style on cool days. Throw on a colorful printed scarf and layer on different length necklaces over neutral shades of black and gray for a look that pops! Rock flower power style prints year round by pairing them with a warm draped cardigan and thigh high knit socks. Monochromatic tie-dye can make any outfit stand out from the crowd. 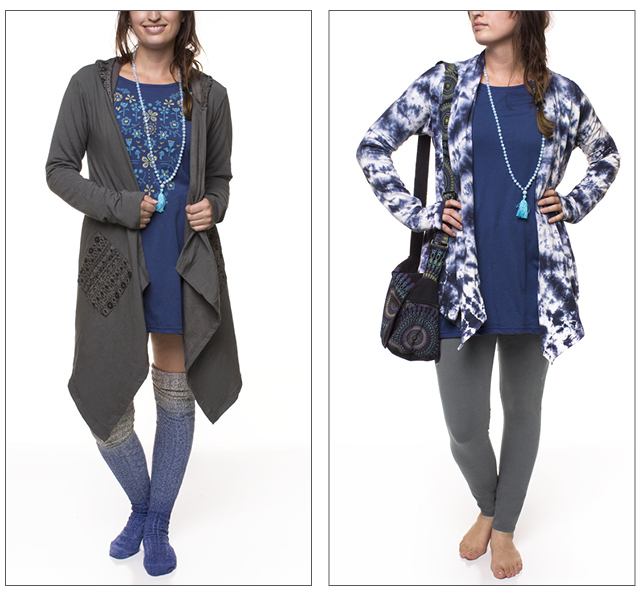 Pair our tie-dye cardigans with a basic tunic top, neutral leggings, and a mala to finish the look. There’s nothing better than earthy-toned tie-dye! Olive and plum hues pair perfectly with our Mudmee Fringe Tie-Dye Shawl. Make a statement with a splash of tie-dye, comfy knit socks and the bold design on this Geo Warrior Organic Cotton Tunic Top .